Adam King recently wrote a great post on his paper based “stay-on-top” set up, titled The Daily Rind. It's the kind of post I've always enjoyed ever since this topic started to replace actual real work. I say that with tongue in cheek, and I'm laughing at myself, not Adam. I always enjoy getting a look at how the people I admire process things and complete their work. The difference for me now is that I quickly recognize the pull to adapt my own habits because their's seem a lot coolor in the flush of caffeine-fueled excitement. Call it what you like, but I'm going to call it maturity. Adam's process of scheduling out his day is great. But it doesn't work for me. In fact, scheduling out my days in a digital format doesn't work for me either. I've come to realize that putting goals down in a calendar format is useless, because my habits tend towards working on what seems more enjoyable at any given moment. Not to say that I don't put my head down and do the menial tasks when needed. But apart from what must get done, I spend my time working on what I most want to see completed on a given day. My process is a little like this. All projects in all their minutiae are captured and fleshed out in OmniFocus. Smaller, less vital reminders are often thrown in Alarms. But truthfully, I'm rarely using either app throughout my days (except when reviewing or processing things in OF, usually on my iPad). When things get moving really fast, I'll scratch a quick list of tasks out on my larger notebook, which is basically a scratch pad. Whatever doesn't get completed in that session gets filed or forgotten, depending on how it feels at the end. 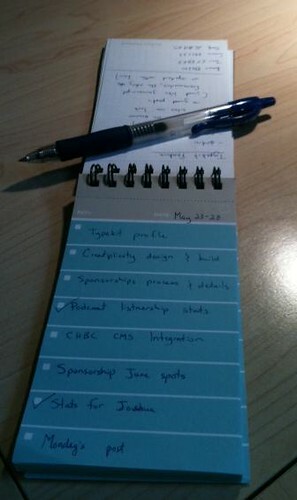 But what I've learned works best for me is a small list of the tasks that are required to move a project to completion. Call them big rocks, MIT's (most important tasks), or whatever else makes you happy. This list follows me around all week, and whenever I find myself lost in a Twitter-induced fog or staring out the window blankly wondering, “What next?”, I glance at my Action Runner and remember what the priorities for the week are. We all work differently, so take my description with a grain of salt. It might not be right for you.